Excellent warmer. My only mistake was not confirming if our electrical panel was able to support 3 warmers. It is not. Fuse kept blowing, we can only use one at a time. Please note these are 1500 watts each! WE use these for our soups and chili, they work really well and fit nicely on our counters in the kitchen! the temp is easy to control and they do not burn things. Great steam table when it worked. The warranty is for 6 months from purchase and the product died just before month 7. Very disappointed in a product that can't even last a year. Thank you for your review, Daniel! We are sorry this Avantco W50CKR 12 inch x 20 inch Full Size Electric Countertop Food Cooker / Warmer - 120V, 1500W has not worked well for you. If you have any concerns about the product you purchased please contact our Customer Solutions team. Very nice product, and great price! Use every single day, usually in high setting. So good, purchased a second. I did purchase a liner for second, only because my use is a little harder then food uses. Great product for the money. Is light and fit our hotel pans perfectly. It warms up quick and kept both chicken and rice extremely warm. !00% satisfied with this product especially for the price. We have two of these and use them both every day, all day. Works great keeping our soup hot and easy to clean. Very affordable. This warmer is perfect for our weekly use. It maintains good heating. The separate areas have allowed us to streamline our service associated with brunch. Perfection! Holds our hot beans at consistent temp. No burning or drying out. Even good to transport to events. I've only had rave reviews since I've added it to my kitchen. This is my first time using a cooker/warmer, and I can honestly say that I can't believe I waited so long! I wanted to use it for dyeing yarn/fiber and am so happy I bought it! This cooker is absolutely amazing... I have so much control over where I put my colors with it. It heats up very quickly and stays hot long after being turned off. Great value for the price I paid. The unit heats quickly and has a nice polished finish. Lightweight and portable for location catering or table service. 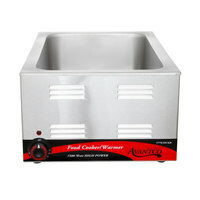 The Avantco W50CKR Electric Countertop Food Cooker \ Warmer is a quality piece of equipment. The temperature controls allow us to properly manage our temperatures and maintain food safe conditions for extended periods with less expense than ordinary chafing units. This item was much needed and is a must have for food establishments. The price is unmatched and the quality is great. We have several Avantco products and are looking to purchase another. We love the versatility of the the cooker/warmer option. We have used this for keeping foods warm on the prep table for fast dish up for our daily specials. I would like to see if there is an option for 1/3 or even 1/4 size pans to even increase the versatility. Clean up is very easy. Cost is extremely affordable even with shipping compared to other sources. I was just at a food manager's health code class. The instructor discussed rapid heating of soups. He cautioned against just the warmer and he suggested microwaving soups OR buying one of these that rapidly heats soups, then you turn it down to the proper holding temp. The price was right, it fits our space. We could not be happier with it. Good product for the money, I ordered two one came in perfect. The other one had a bent leg and the assembly process was not completed. The warming pan was not bolted to the base. You could hear the nuts rolling around inside and not just one but all 6 were not installed. I had to dissemble and put it together myself. If I wasn't pushed for time I would have sent it back. We appreciate your review, Amy! A Customer Solutions Representative will be contacting you shortly.